Glad to report a tranquil, drama-free day … three previous times Cleddau has been moored up here, first in July 1994 (archives checked, it was Cleddau’s first long distance cruise), then in April 2008, as an overnight stop during the Kennet and Avon to Macclesfield Canal transfer, the Physicist was with us) and again last year, during which we were nearly boarded by pirates… (See blog, Tuesday 31st August). This large artificial lake offers glorious views across to Tixall Gatehouse, an imposing Elizabethan structure. Last night the ringing of church bells drifted across the water as the ducks bid goodnight. And what better sound to wake to than birdsong and geese…? Our port side lies alongside the towpath, beyond which are low-lying fields in which cows graze, the fields probably part of the Shugborough Hall Estate. It took a ten minute stroll back to the Great Haywood Junction, a further five minutes along to Haywood Lock to the pedestrian entrance into Shugborough Park. The access is across a pretty bridge over the gentle River Trent – too narrow for a carriage, but maybe wide enough for a sedan chair. As National Trust members we were green-stickered, thus gaining free entrance to house and gardens (and there would have been reduced rates for entry to the working farm and the Servants’ Quarters, had we chosen to visit those too.) Until the mid 1700s Shugborough Hall was just a gentleman’s country residence. An Anson (readers of Court Circulars and society pages these days might recognise the name of Lady Elizabeth Anson) was a successful naval admiral and his prize money in taking a Spanish treasure ship financed the house’s transition into a mansion. Rising to First Lord of the Admiralty he was endowed with the Earldom of Lichfield. This grand house is now staffed by Staffordshire County Council guides who readily explain the architectural features and the family’s past. But since March of this year (how lucky was this) further apartments have been opened, those of the late society photographer, cousin to the Queen, Patrick Lichfield. What a surprise to see his 1960’s photographs of still famous names, Joanna Lumley, Olivia Newton John and Lulu! Dotted around too are photographs he had taken over the years of the Royal Family. The apartments are in up-market 60s style, but the 1920’s plumbing was, well, quaint. The grounds and gardens are lovely, enhanced by various stone monuments and, currently, by a sculpture trail. Certainly the visit was a peep into a completely different world. Just one short mini-rant: Boatwif finds it hard to forgive herself if a spelling error slips through. Currently she berates herself for last night having spelled Great Haywood as Great Heywood. Apologies all. But since today has been a look into the past what would Mr Shakespeare, Mr William Shakespeare, dramatist, late of Stratford-upon-Avon, make of this? A time-share fleet, the Shakespeare Classic Line, names its boats after plays. 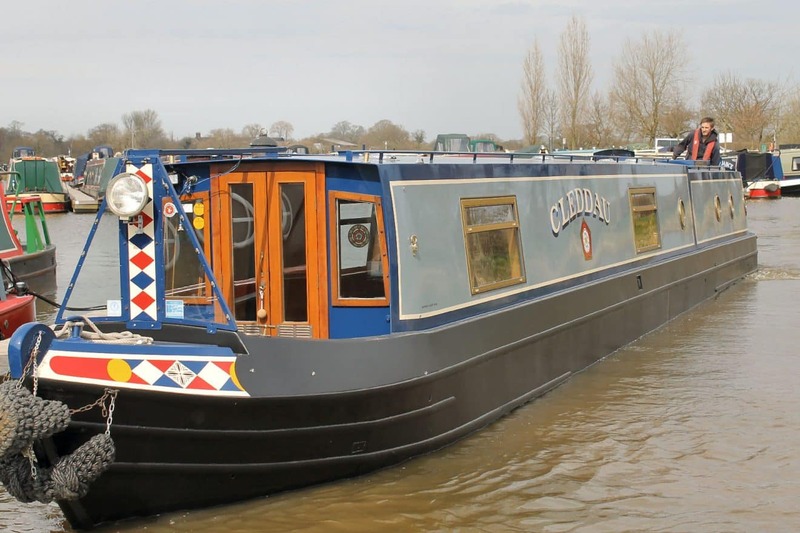 One boat, spotted first on the Macc, then at Great Haywood, has its name Cymbeline writ large upon the side of the boat – and Cymberline on the bow. Its current helmsman hired it last year too – and informed fleet managers then of the spelling discrepancy… Now what would Mr Shakespeare have made of that?